With ten times the workload capacity of desktop drives, WD Gold hard drives feature advanced technology that delivers industry leading reliability, capacity, power efficiency and performance. Designed for a multitude of Datacenter-specific applications, WD Gold hard drives are perfect for high-availability server and storage arrays that demand the most robust storage device available with 24/7 premium customer support. Full range of nearline capacities - From boot servers to high end enterprise storage systems, WD Gold hard drives offer the capacities required for the most demanding datacenter environments. 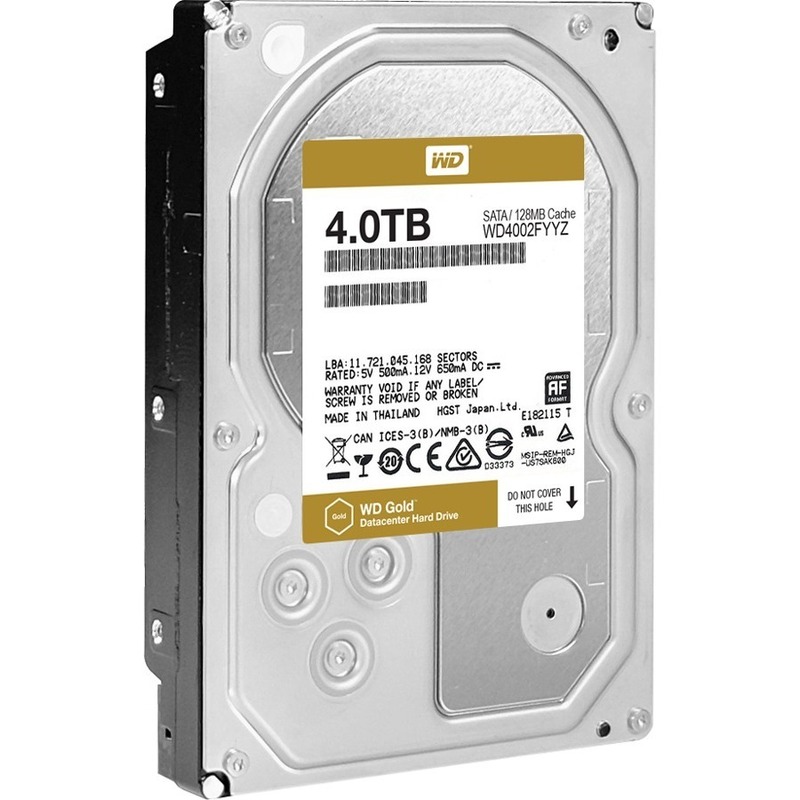 Highest workload capability - Delivering both performance and reliability to any datacenter environment, WD Gold hard drives are designed to handle up to 550TB per year which is the highest workload capability of any 3.5-inch hard drive. Highest level of reliability - With up to 2.5 million hours MTBF, WD Gold hard drives deliver the highest level of reliability and durability for yearly operation (24x7x365) within the most demanding storage environments. Vibration Protection - Enhanced RAFF technology includes sophisticated electronics to monitor the drive and correct both linear and rotational vibration in real time. The result is a significant performance improvement in high vibration environments over other desktop hard drives. RAID-specific, time-limited error recovery (TLER) - Prevents drive fallout caused by the extended hard drive error-recovery processes common to desktop drives. Extended thermal burn-in test - Each drive is put through extended burn-in testing with thermal cycling to ensure reliable operation. Dual actuator technology - A head positioning system with two actuators that improves positional accuracy over the data track(s). The primary actuator provides coarse displacement using conventional electromagnetic actuator principles. The secondary actuator uses piezoelectric motion to fine tune the head positioning to a higher degree of accuracy. Compatibility testingAll WD Gold hard drives are extensively tested across a variety of popular OEM storage systems, SATA controllers, and host bus adapters, to ensure ease of integration for a plug and play solution. Premium supportDedicated 24x7 over the phone support is included with every WD Gold hard drive. Full range of nearline capacities - From boot servers to high end enterprise storage systems, WD Gold hard drives offer the capacities required for the most demanding datacenter environments. 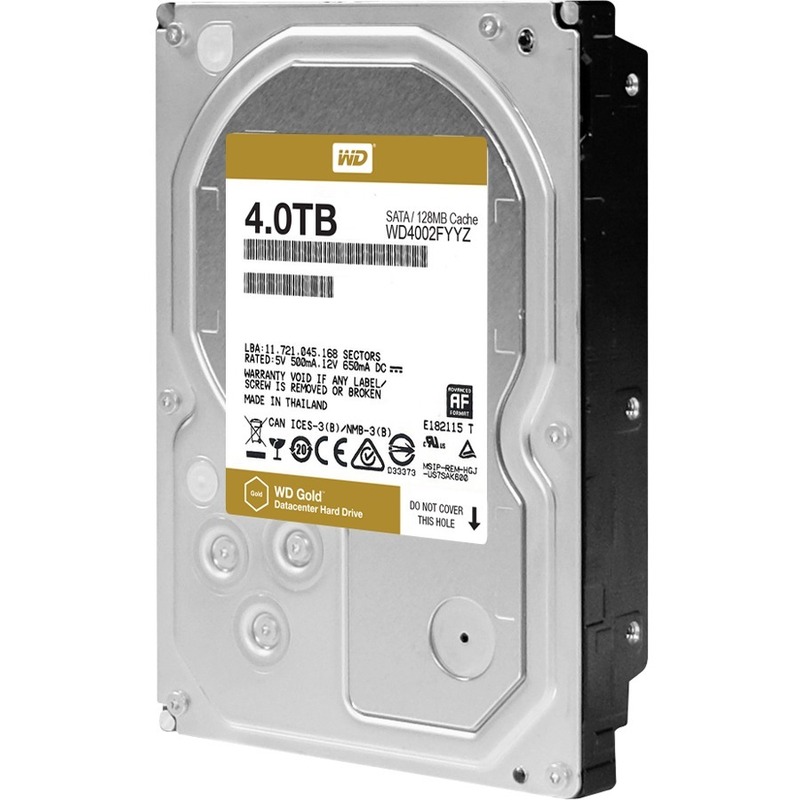 Highest workload capability - Delivering both performance and reliability to any datacenter environment, WD Gold hard drives are designed to handle up to 550TB per year which is the highest workload capability of any 3.5-inch hard drive. Highest level of reliability - With up to 2.5 million hours MTBF, WD Gold hard drives deliver the highest level of reliability and durability for yearly operation (24x7x365) within the most demanding storage environments. Vibration Protection - Enhanced RAFF technology includes sophisticated electronics to monitor the drive and correct both linear and rotational vibration in real time. The result is a significant performance improvement in high vibration environments over other desktop hard drives. Extended thermal burn-in test - Each drive is put through extended burn-in testing with thermal cycling to ensure reliable operation.